The burrito boom might be over. Chipotle reported its worst quarterly sales growth, 12%, in over two years on Tuesday. Chipotle simply isn't growing at the stellar speed it once did. 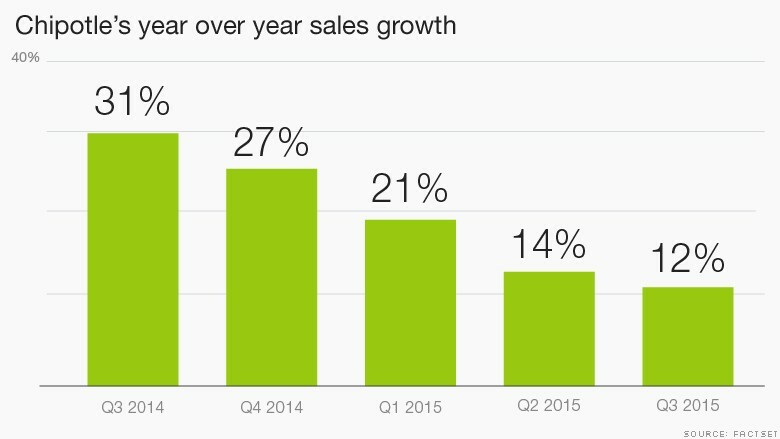 Its sales growth has been declining for four consecutive quarters. Although the restaurant reported earnings that most companies would envy, investors weren't pleased. 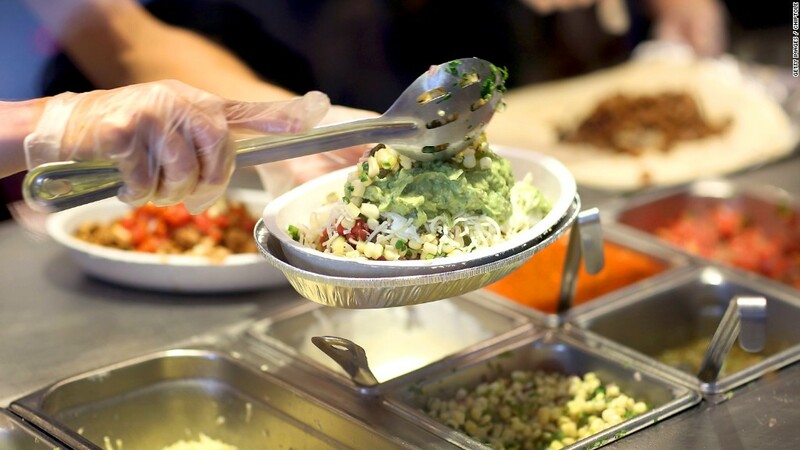 Chipotle's stock fell 6% in after hours trading once earnings were announced. Chipotle's CEO and co-founder, Steve Ells, tried to stay upbeat about the fast casual chain's progress. "I am confident that we have the right food culture and people culture in place for us to continue our momentum," Ells said in a statement. Chipotle's slowing growth is a sign of its already big footprint. At the beginning of 2012, Chipotle had over 1,200 restaurants. By the end of this year, analysts project Chipotle will have nearly 2,000 restaurants. The key metric for the restaurant industry -- same store sales growth -- is now very low for Chipotle. It fell to 2.6% in the third quarter. A year ago, Chipotle's same store sales growth was 19.8%. At some point, it's hard to maintain the skyrocketing growth that Chipotle (CMG) has become synonymous with. Its stock has soared from $250 a share three years ago to over $700 today. Now the stock looks expensive. A popular measure of how pricy a stock is -- the price-to-earnings ratio -- is high for Chipotle at 43. The valuations for McDonalds (MCD), Panera (PNRA) and Yum Brands (YUM) are all well below that. The S&P 500's current P/E ratio is about 25. To address slowing sales, Ells might be trying to steal some thunder from others. Chipotle recently hired Curt Garner, the former chief information officer of Starbucks (SBUX), to be the first CIO of Chipotle starting in November. Garner helped lead some of Starbucks' tech infrastructure initiatives. His task will be to improve on the $1.2 billion in sales the company reported between July and September. It has opened 150 new restaurants so far this year.